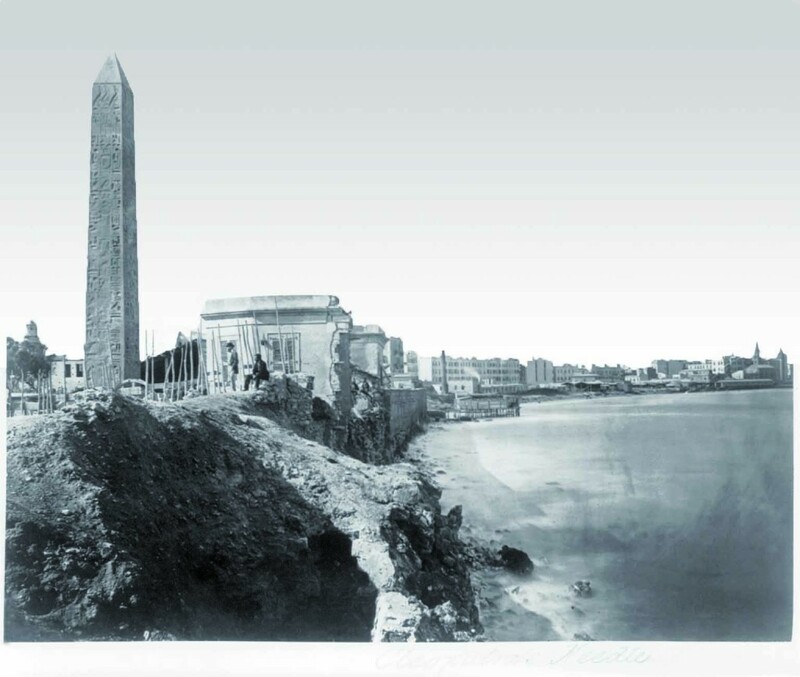 In January 1869, exactly 150 years ago, Miss Riggs joined Thomas Cook’s very first tour to Egypt and the Holy Land. Travelling overland, the journey would take three months, there and back. Miss Riggs kept a diary of her adventure and I am going to be posting from it over the coming weeks. This is day ten. On deck by 8 – rough night, getting more to the open sea in sight of Cerigo – sea the deepest indigo. 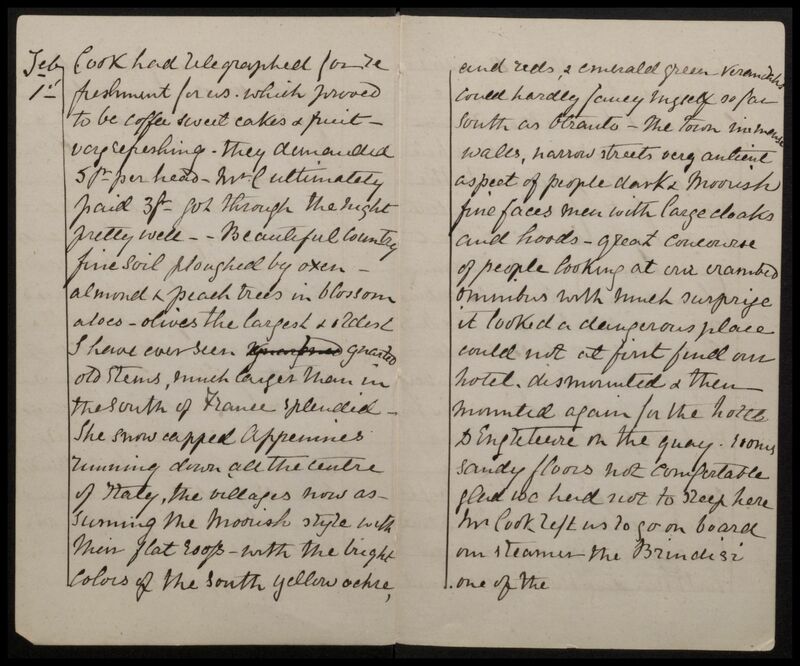 In the afternoon passed Candia – immense island, seemed almost like the main land; passed Cape Matapan – all queer and very quiet all morning = after dinner brightened up – discussions going on – Dr. Lorn on bishops. All agreed that we were a very harmonious party. At Brindisi all our party were assembled, Mr. Margetts being the last who joined us from Naples. I will insert our list which is now complete. Expected to land at Alexandria tomorrow morning – 850 miles from Brindisi to Alexandria. Arranged this evening that we should all give 3 fr. for servants. 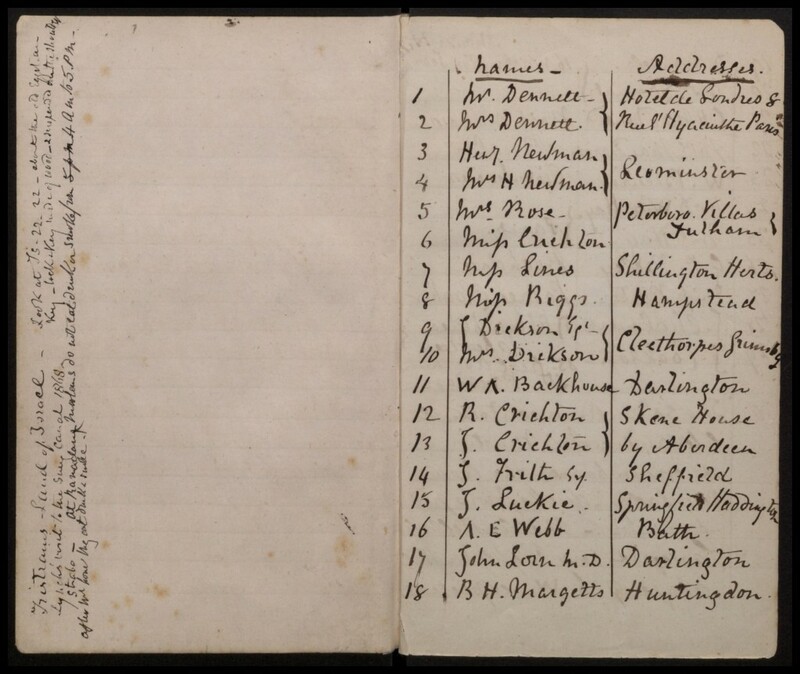 The list of her fellow passengers is inserted on the front pages of her diary. 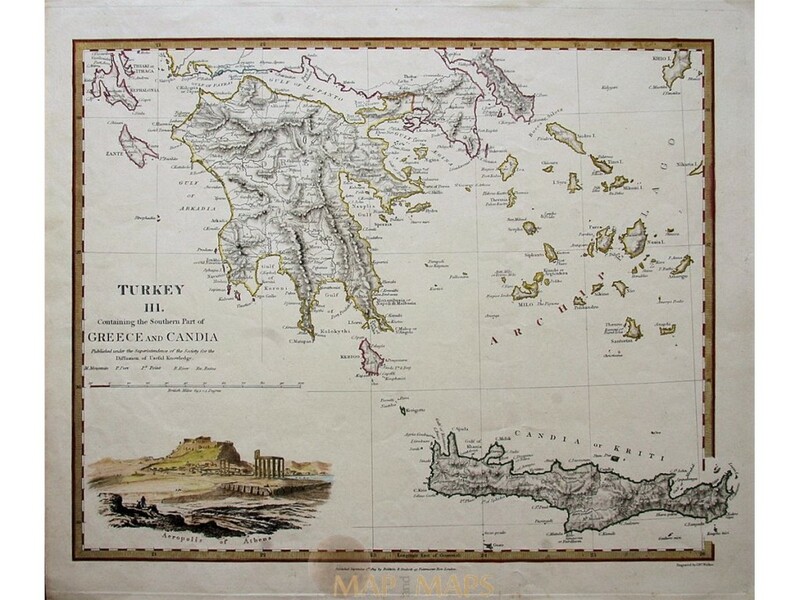 When it comes to geography, Miss Riggs uses names that were antiquated even in 1868, so Cerigo is Kythria and Candia is Crete. But who is Miss Riggs? The list of names she supplies in today’s entry offers almost all the information we have on her, which is that she lives in Hampstead, north London. The only clue to knowing more about her comes from Thomas Cook’s own notes on the trip, which were published in the company newsletter later that year. In these he talks about the composition of the tour party, mentioning seven ladies traveling with their husbands, none of which are the unmarried “Miss” Riggs, one lady in the company of her parents, which would be Miss Crichton, and one “attendant upon a lady of the party”—was Miss Riggs a ladies’ maid? Perhaps for Miss Porter with whom she shares a cabin? Or was Miss Porter the maid and Miss Riggs the lady? We don’t know. 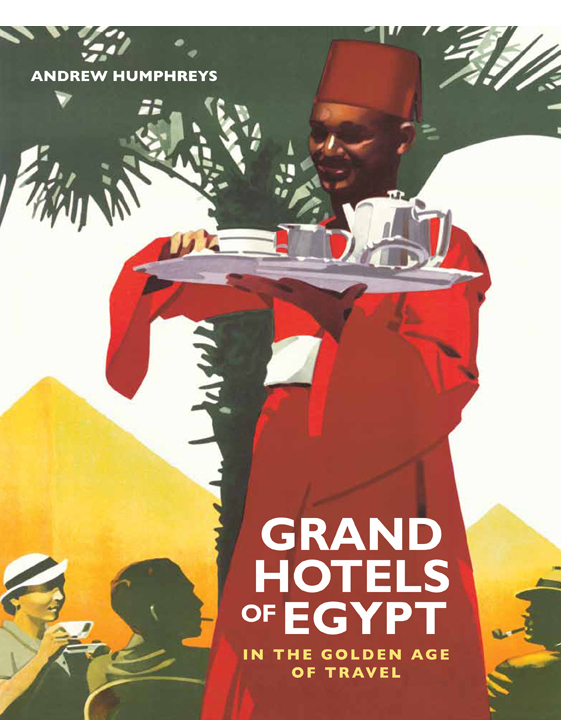 One thing to remember, anyone signed up to this first tour to Egypt and Palestine would have to be fairly wealthy. Travel was extremely expensive, not to mention time-consuming. In general, a trip like this was something that could only be undertaken by those who did not need to work year-round to earn money. Tomorrow our privileged party arrives in Alexandria. 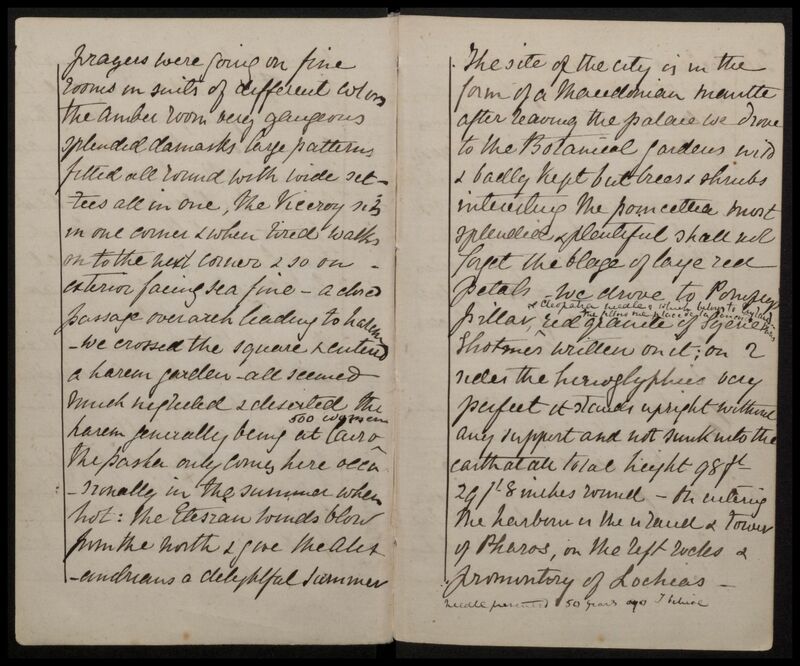 In January 1869, exactly 150 years ago, Miss Riggs joined Thomas Cook’s very first tour to Egypt and the Holy Land. Travelling overland, the journey would take three months, there and back. 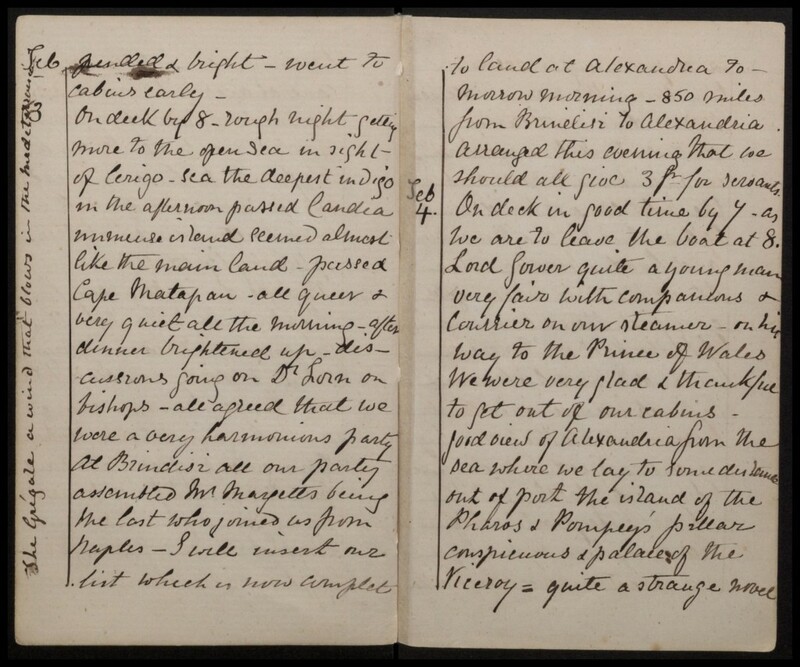 Miss Riggs kept a diary of her adventure and I am going to be posting from it over the coming weeks. This is day nine. Appeared at breakfast at 9 – nearly all the others ready. 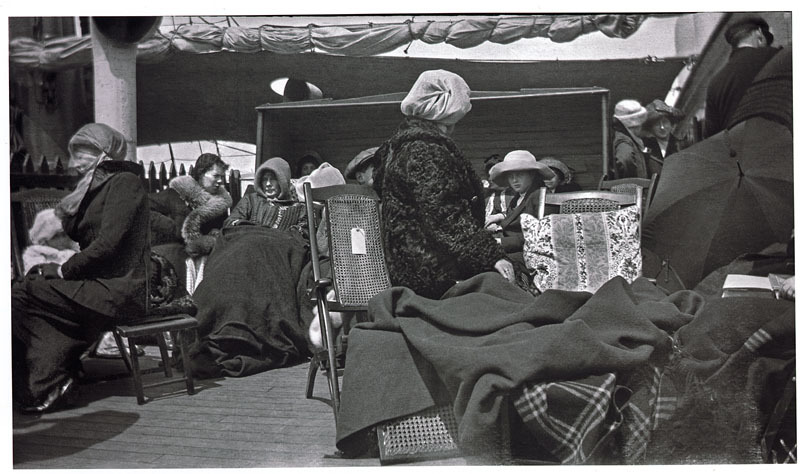 Afterwards mounted on deck and now sitting – at least the ladies on comfortable cane chairs with arms, where we shall be all day, too rough to walk about on deck and afraid to lose our seats if we move. Six of us all in a row sitting under shelter of skylight to saloon. Passed during the day Corfu, Kephalonia and Zante. 2 porpoises followed us playing most prettily. Table d’hote at 5 – afterwards we came on deck again and some Italians – I imagine professionals, sang from the operas for two hours. Tea at 8, and afterwards I read Lloyd’s Oriental Guide for Egypt in saloon, lamps suspended brightly – went to cabins early. After the hard slog of eight days of swapping trains and carriages the sail across the Mediterranean sounds blissful – although the Italians sound a nuisance. 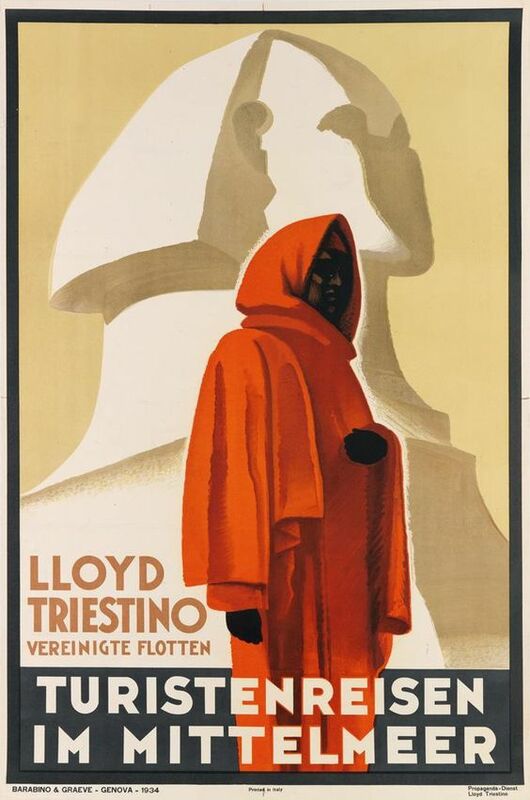 I have never seen any other reference to a Lloyd’s Oriental Guide but I’m guessing it might be something put out by the German Lloyd’s shipping company, which operated services to Egypt. In January 1869, exactly 150 years ago, Miss Riggs joined Thomas Cook’s very first tour to Egypt and the Holy Land. Travelling overland, the journey would take three months, there and back. 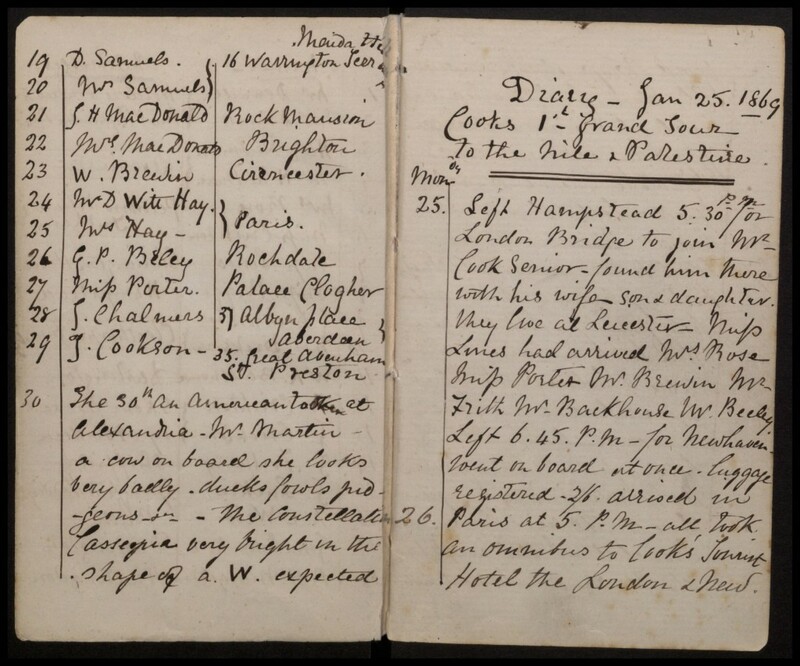 Miss Riggs kept a diary of her adventure and I am going to be posting from it over the coming weeks. This is day eight. For the past two days Miss Riggs and the rest of her Cook-led party have been making their way south down through Italy. On the morning of 30 January they left Turin for Ancona, crossing the plains of Lombardy, and via Foggia arrived at their destination of Brindisi on the southeast coast early on 1 February. … Could hardly fancy myself so far south as Otranto – the town immense walls, narrow streets; very ancient. Aspect of people dark and Moorish – fine faces. Men with large cloaks and hoods – great concourse of people looking at our crammed omnibus with much surprise. It looked a dangerous place. 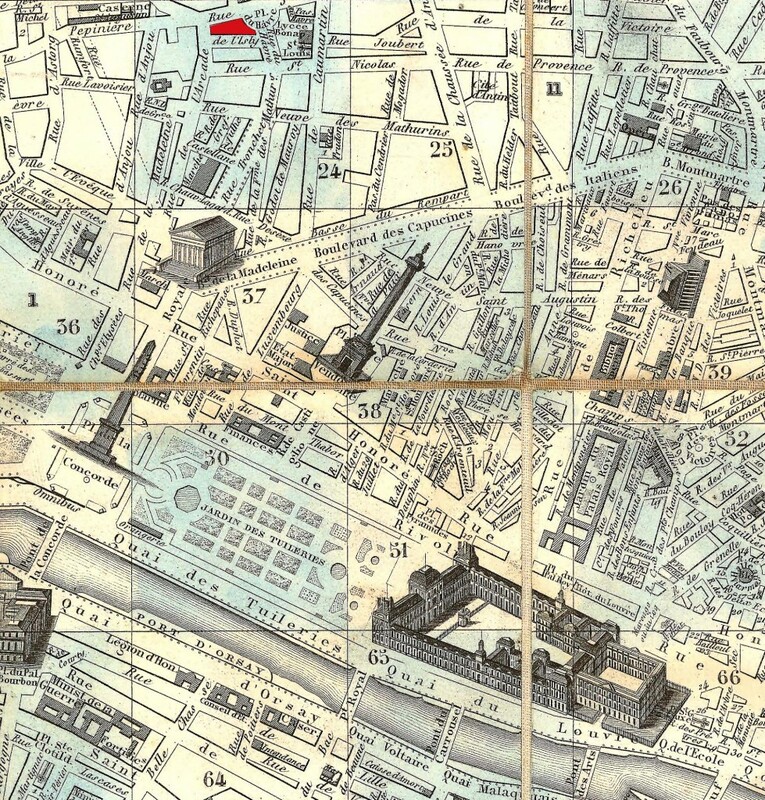 Could not at first find out hotel; dismounted and then mounted again for the hotel d’Angleterrre on the quay. Rooms sandy floors, not comfortable – glad we had not to sleep here. Mr. Cook left us to go on board our steamer, the Brindisi, to secure our berths. Brindisi 1420 miles from London. We lunched at hotel and then took a stroll around the town and then proceeded to the steamer in little boats; very dark. Set sail at 9 in the evening – Captain Young, and handsome good vessel, cabins opening into the saloon. 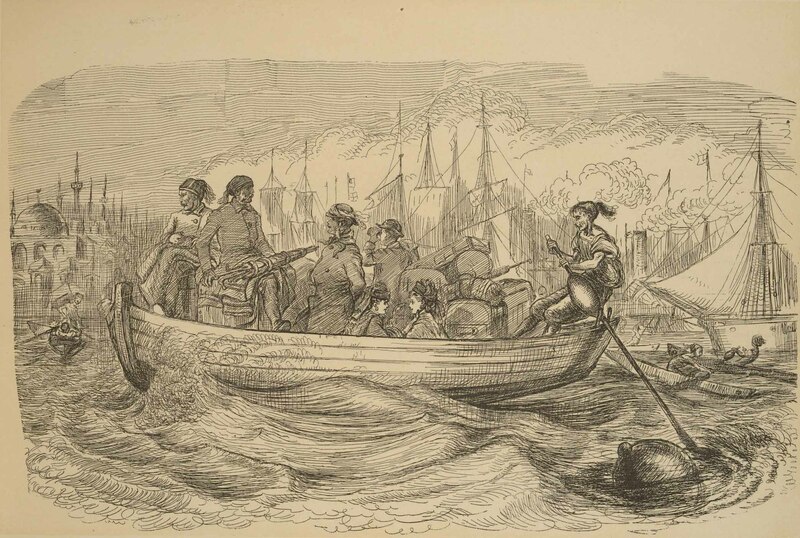 Mine and Miss Porter’s did not do so, not so comfortable in consequence; very little room for storage in the cabin – mine top berth, but could not have round window open – very close. Deck good – fine evening, bright stars. All stayed on deck some time, all in good spirits notwithstanding the wind seemed up for a breeze. 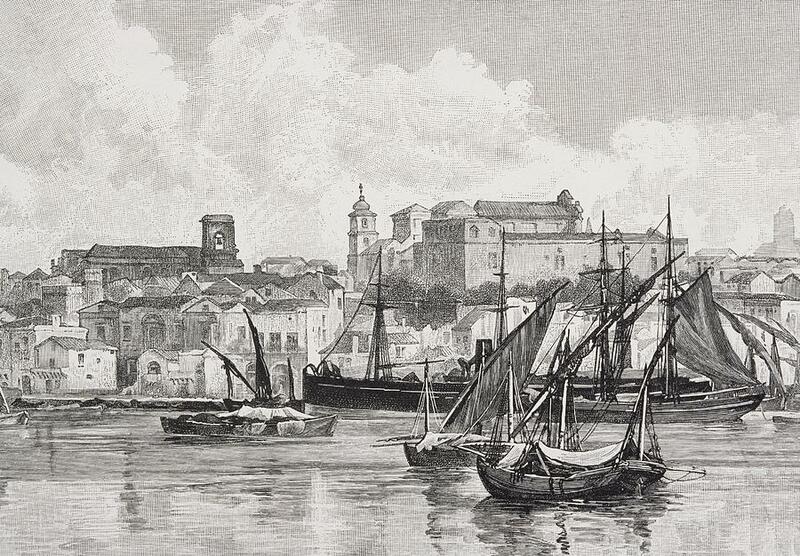 So the party has now crossed Europe and arrived at the port of Brindisi [pictured above], where, a bit confusingly, they board a steamer also called Brindisi. Miss Riggs mentions Otranto, which is a port just a little way south of Brindisi. I’m not sure why it would be important to her but, being religiously inclined, possibly she knows of the story of the ‘Martyrs of Otranto’, 800 citizens who were beheaded after refusing to convert to Islam when the Ottomans captured the town in 1480. 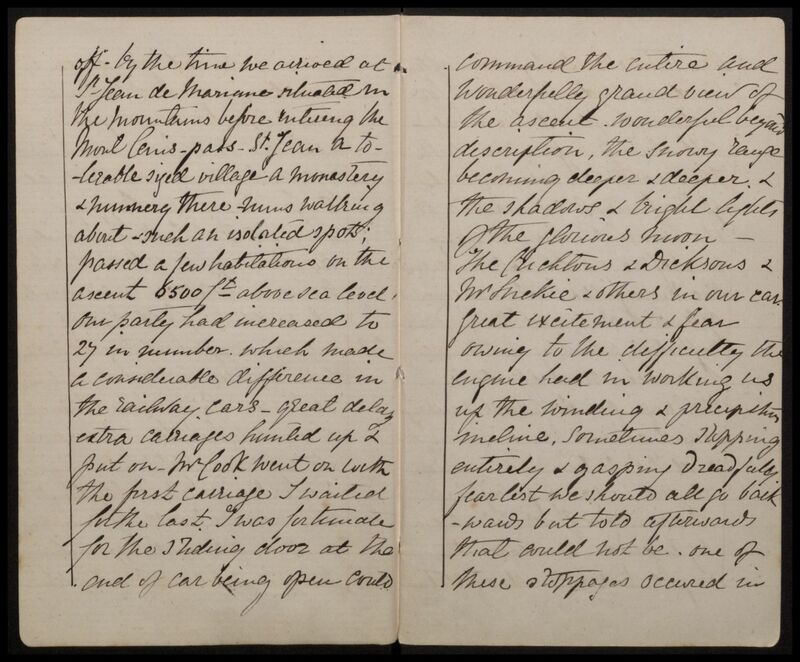 In January 1869, exactly 150 years ago, Miss Riggs joined Thomas Cook’s very first tour to Egypt and the Holy Land. Travelling overland, the journey would take three months, there and back. 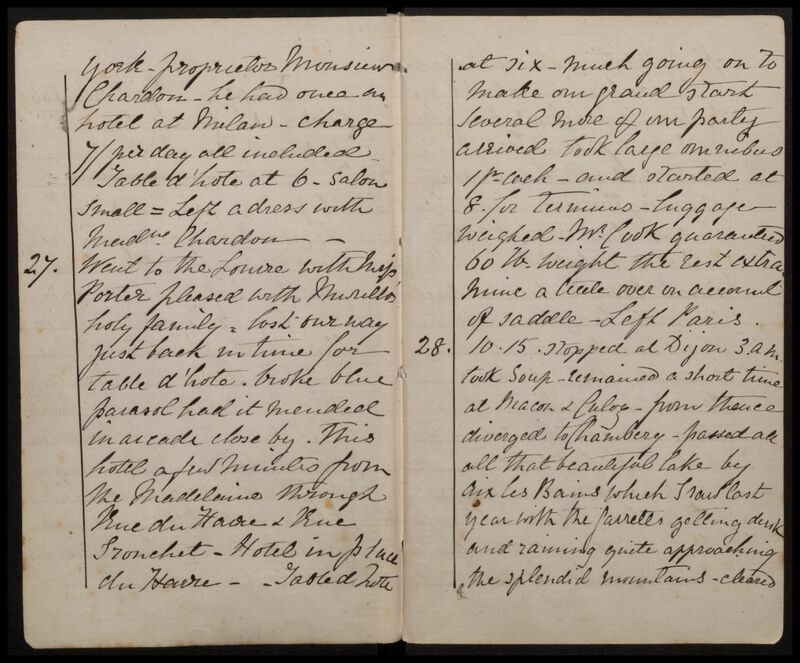 Miss Riggs kept a diary of her adventure and I am going to be posting from it over the coming weeks. This is day five. 4 a.m. all very tired and excited, some saying they would never do that pass again [see yesterday’s entry] – had coffee at our Hotel Trombetta. 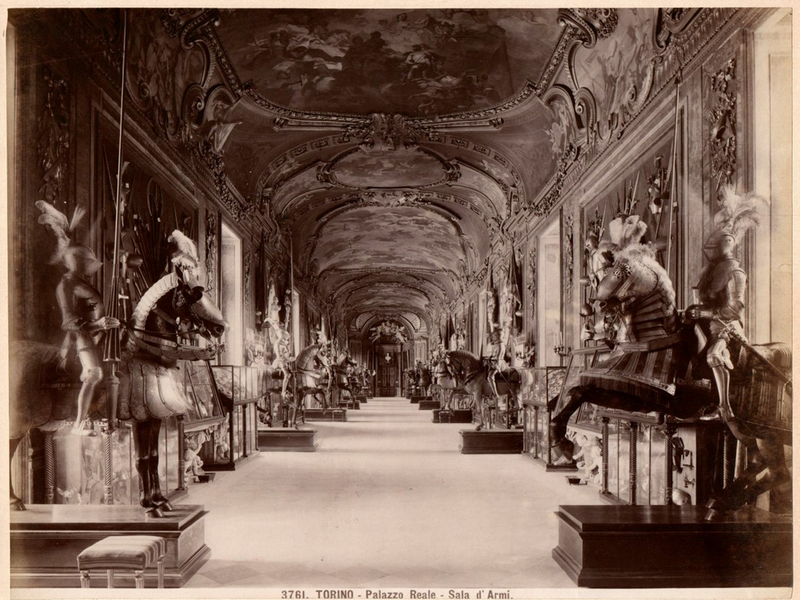 Went to bed for a few hours – down to breakfast at 10 o’clock – to the Palazza Reale [above], formerly the residence of Charles Albert – now unoccupied; rooms fine, floors inlaid wood – a great deal of gilding – portraits principally of the Savoy family – a chapel attached principally black marble. An old castle the only antiquity in Turin with polygonal tower in the Piazza Castello. 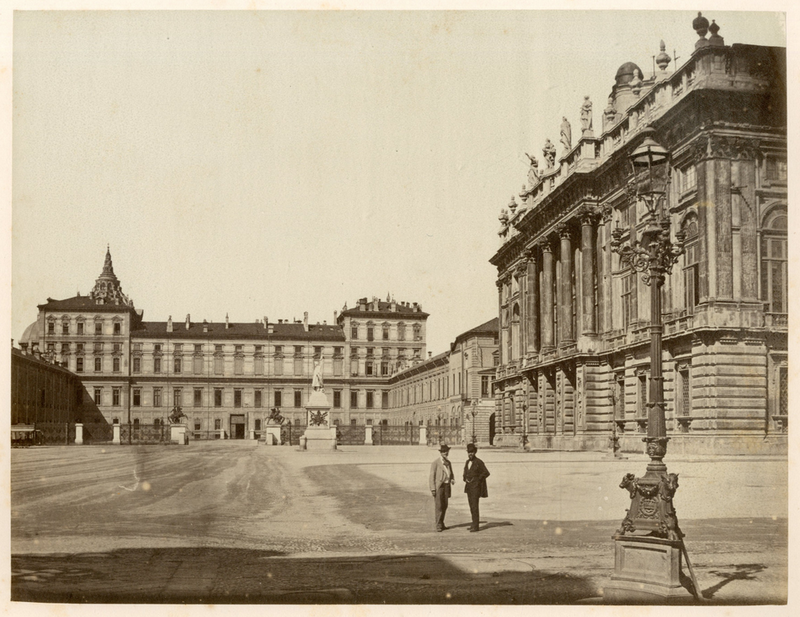 Many squares in Turin and Colonnades. Snowing today. Fortunate we are to be on this side of Mont Cenis – had there been more snow could not have passed; what would we have done. Our party make a great increase at this hotel, an amusing set. I am exploding with laughter. At 2 o’clock accompanied Mr. Cook to station to claim our luggage, and all heavy luggage was booked on to Brindisi. Kept our small packages. At hotel eat long pieces of thin rolled paste baked lightly, called Grisli after the makers name. Seems odd that a tour group heading for Egypt with a day to kill in Turin wouldn’t visit the city’s Museum of Antiquities. This had one of the world’s finest collections of Egyptian antiquities, including the 5,268 pieces bought from the French consul-general to Egypt Bernadino Drovetti. Too busy, perhaps, having a laugh at the hotel. That’s tour groups for you. I wonder if the snacks she calls Grisli are actually breadsticks, known in Italy as Grissini, and supposedly invented in a small town outside of Turin. 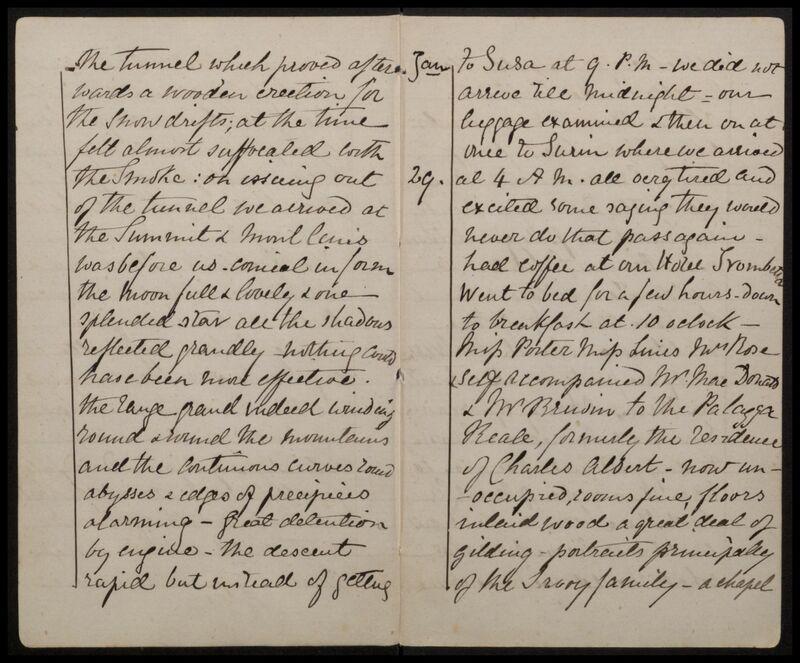 In January 1869, exactly 150 years ago, Miss Riggs joined Thomas Cook’s very first tour to Egypt and the Holy Land. Travelling overland, the journey would take three months, there and back. Miss Riggs kept a diary of her adventure and I am going to be posting from it over the coming weeks. This is day four. Stopped at Dijon 3 a.m., took soup. 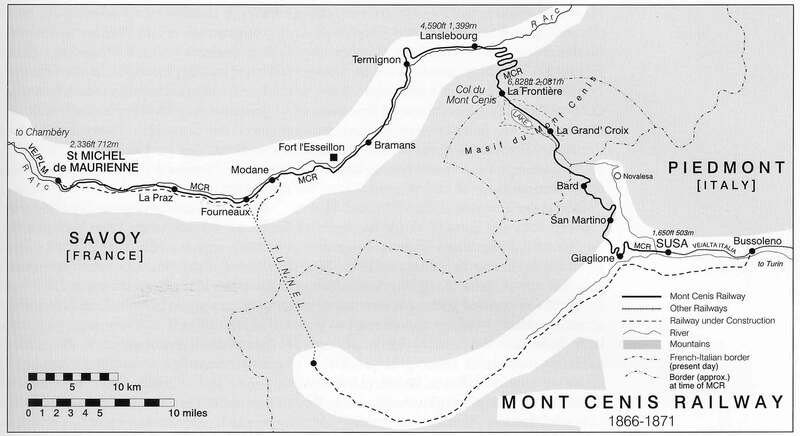 Remained a short time at Macon and Culoz – from thence diverged to Chambery – passed all that beautiful lake by Aix-les-Bains which I saw last year with the Garrets. Getting dark and raining quite approaching the splendid mountains – cleared off by the time we arrived at St. Jean de Maurienne, situated in the mountains before entering the Mont Cenis pass. St. Jean a tolerable sized village. A monastery and nunnery there – nuns walking about. Our party had increased to 27 in number which made a considerable diference in the railway cars – great delay – extra carriages hauled up and put on. Mr. Cook went on the first carriage. I waited for the last. I was fortunate for the sliding door at the end of the car being open, could command the entire wonderful grand view of the ascent. Wonderful beyond description, the snowy range becoming deeper and deeper, and the shadows and bright lights of the glorious moon. Great excitement and fear owing to the difficulty the engine had in working us up the winding and precipitous incline, sometimes stopping entirely and gasping dreadfully. Fear lest we should all go backwards. One of these stoppages occurred in the tunnel; felt almost suffocated with smoke. On issuing out of the tunnel we arrived at the summit and Mont Cenis was before us, conical in form, the moon full and lovely. 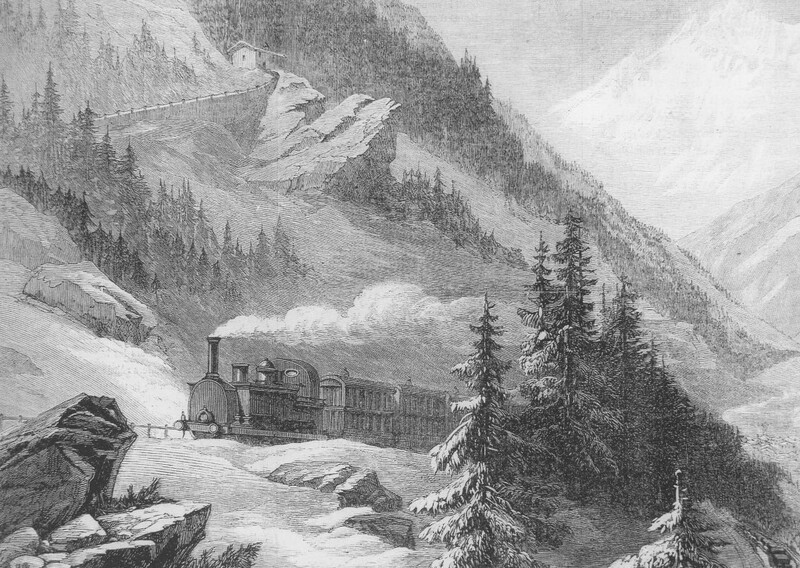 The Mont Cenis Pass Railway was the first mountain railway in the world and had been operating just over six months when the Cook party used it to travel from southeast France to northwest Italy. It would only operate until 1871, after which it was superseded by a new tunnel railway. In January 1869, exactly 150 years ago, Miss Riggs joined Thomas Cook’s very first tour to Egypt and the Holy Land. Travelling overland, the journey would take three months, there and back. Miss Riggs kept a diary of her adventure and I am going to be posting from it over the coming weeks. This is day three. 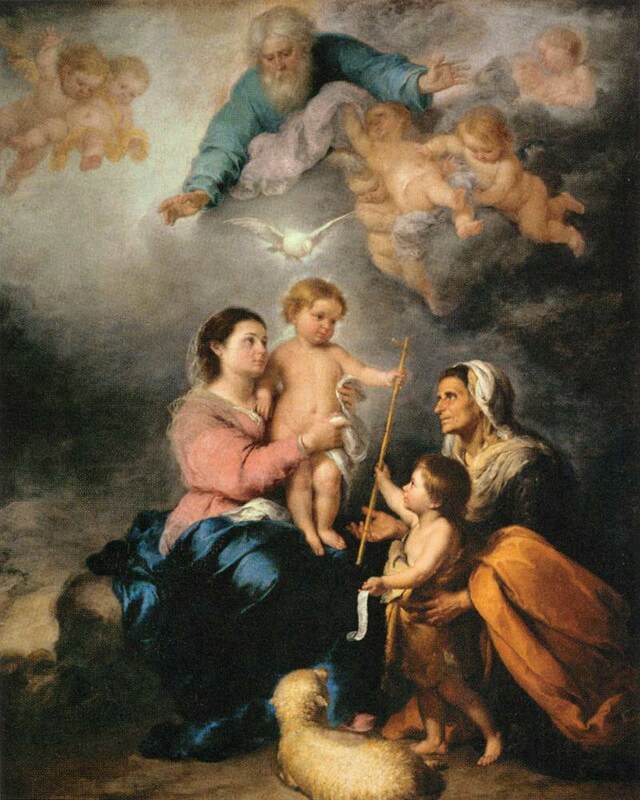 Went to the Louvre with Miss Porter – pleased with Murillo’s Holy Family = lost our way, just back in time for table d’hote. Broke blue parasol – had it mended in arcade close by. This hotel a few minutes from the Madeleine through Rue du Havre and Rue Tronchet – hotel in place du Havre. Table d’hote at six – much going on to make our grand start. Several more of our party arrived. Took large omnibus 1 fr. each – and started at 8 for terminus – luggage weighed. Mr Cook guaranteed 60 lb weight, the rest extra. Mine a little over on account of saddle. Left Paris 10.15 –. Yesterday Miss Riggs arrived in Paris, today she leaves. That’s some tight schedule. But then this is a tour of Egypt and the Holy Land that she signed up for and Paris is just an overnight halt between trains. Happily the hotel is very central (marked in red on the map above), so she does manage a little sightseeing. Below is the Murillo painting that ‘pleased’ her. I don’t think Miss Riggs and I would get along when it comes to art. As well as being a tyrant on time, the tour leader Mr Thomas Cook is similarly severe when it comes to baggage. His party is allowed just 60lbs per person, which is just under 30kg. That is nothing. 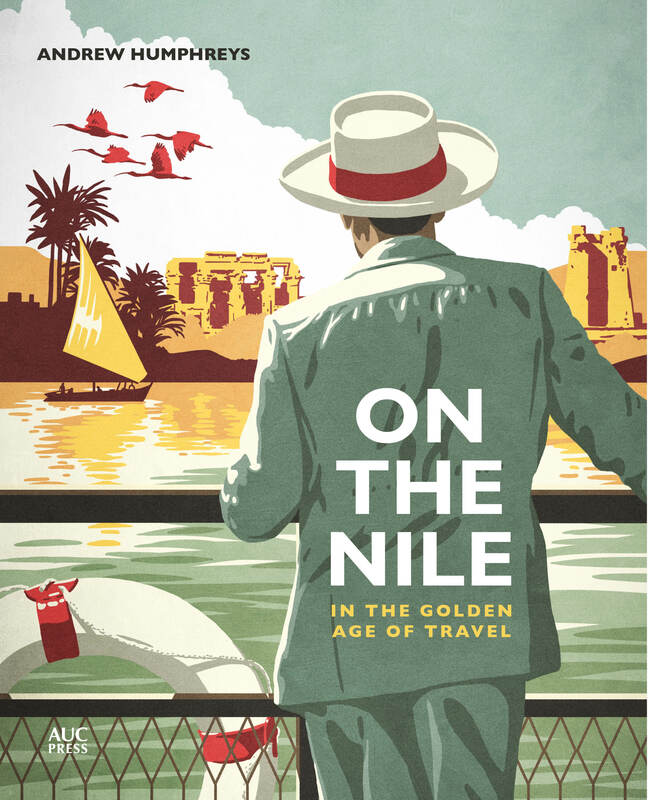 Most holidaymakers these days travel with that for a week in Marbella, and Miss Riggs and her colleagues are heading overland across Europe and to Egypt and back, a journey that is advertised to take three months. Although why she would want to drag a saddle with her all that way is a mystery. 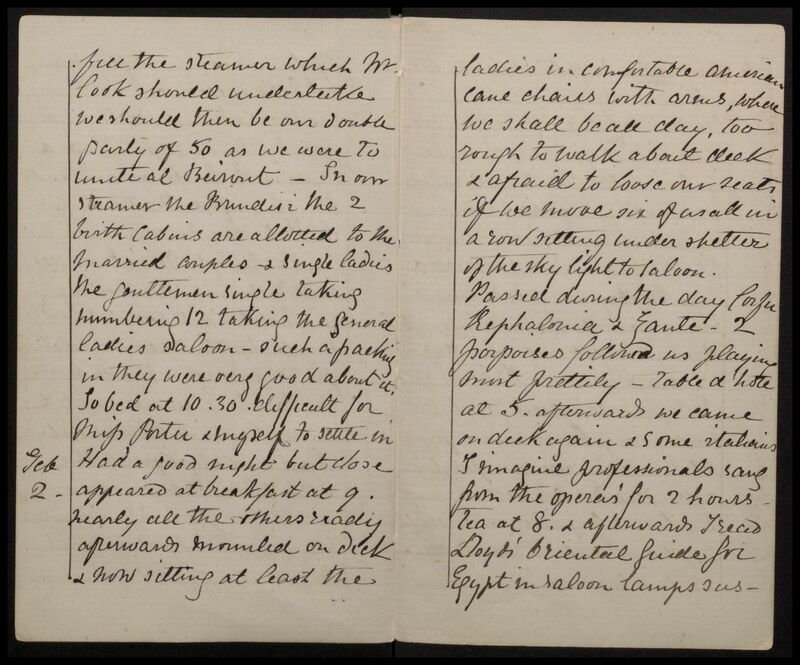 Following on from yesterday’s post, here’s what Miss Riggs wrote in her diary the day after leaving London. Arrived in Paris at 5pm – all took an omnibus to Cook’s Tourist Hotel the London & New York – proprietor Monsieur Chardon – he had once an hotel at Milan. Charge 7/- per day all included. Table d’hote at 6 – salon small – left a dress with Madame Chardon. She set off yesterday from London Bridge train station at 5.30pm and almost exactly 24 hours later she has arrived in Paris. Last year I had to travel from London to Paris at too short notice to get a ticket on the Eurostar train. Instead I had to go by coach down to the south coast of England, transfer to the rail freight service, then back on to the road at Calais and onwards to Paris. It took ten hours, so for Miss Riggs’ party to make the same journey in under a day – remember, this is 150 years earlier – seems pretty good going. 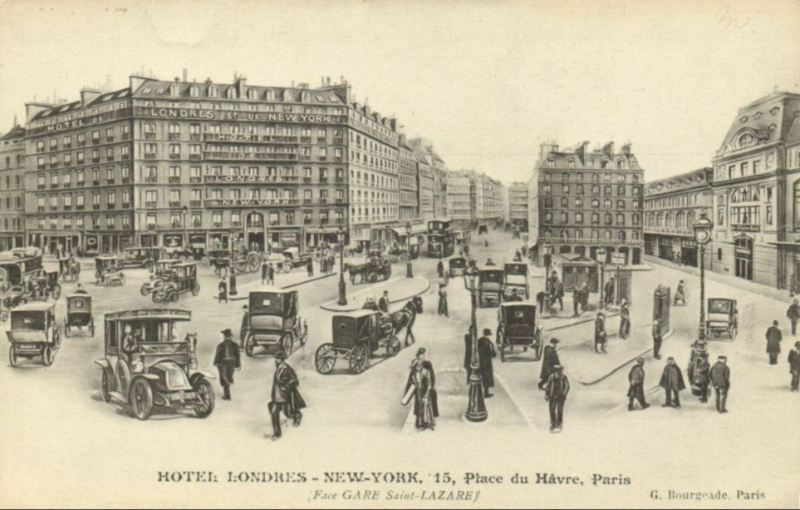 The postcard above shows her hotel, the London & New York, which stands across from the Gare St Lazare – although, obviously, with a street full of motor cars this image must date from about 50 years after Miss Riggs’ visit. I say the hotel “stands” because it’s still there today, although no longer looking anywhere near as grand.